Germany to Return Remains - But Not Sorry for Namibia Genocide? German Minister Theresia Bauer presents Hendrik Witbooi's possessions to President Hage Geingob. The return of Nama Captain, Hendrik Witbooi's personal Bible and whip, has produced the very first semi-official apology from a German government official, for the atrocities against the Nama and Herero peoples from 1902 to 1904 during the German colonial period. Accompanied by a mixed delegation comprising 23 individuals from German academic and cultural institutions in the State of Baden-Württemberg, the State Minister of Science, Research and Arts, Hon Theresia Bauer, presented Captain Witbooi's possessions to the President, HE Dr Hage Geingob at a ceremony at Gibeon, the governance seat of the Nama leader. Minister Bauer expressed her remorse and regret for the atrocities committed by German soldiers. With the return of the Bible and whip she wished to honour Hendrik Witbooi as a freedom fighter. "We are deeply sorry for the injustices of the past and the long delay in the return of the Bible and whip of Hendrik Witbooi. However, we can not undo the past. Therefore, today should not be the end, but the beginning of a better and united future," the minister told Geingob and the Nama community at Gibeon. 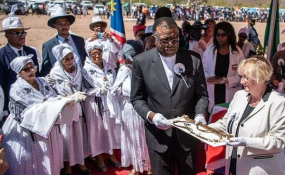 She personally handed the Bible and whip to Geingob, who in turn presented them to the elders of the Witbooi family. The elders then handed the artefacts over to Minister of Education, Arts and Culture, Hon Katrina Hanse-Himarwa for care and custody by the ministry. Minister Bauer, together with Hon Ida Hoffmann and the Permanent Secretary, Sanet Steenkamp, visited Hornkranz where the first German battle against the Namas took place. Minister Bauer's delegation also had discussions with representatives of several Namibian institutions before returning to Germany on 02 March. Caption: Baden-Württemberg State Minister, Hon Theresia Bauer presents to the Namibian President, HE Dr Hage Geingob, the personal Bible and whip of Nama leader, Hendrik Witbooi. A 24-person German delegation visited Namibia last week to return the Bible and whip of Nama Captain, Hendrik Witbooi. The two artefacts have been kept at the Linden Museum in the German State Baden-Württemberg since 1902. Among the delegation, were the State Minister of Science, Research and Arts, Hon Theresia Bauer, and the State Secretary Petra Olschowski. Copyright © 2019 Namibia Economist. All rights reserved. Distributed by AllAfrica Global Media (allAfrica.com). To contact the copyright holder directly for corrections — or for permission to republish or make other authorized use of this material, click here.